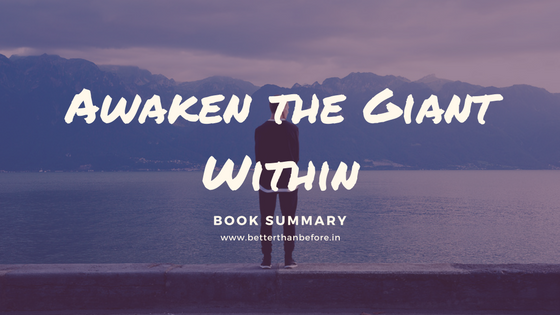 Awaken the Giant Within is a bestselling self-help book by Tony Robbins which tells about the Tony’s most effective strategies for mastering our lives. Here is the summary of what I learned from the book. Significant changes come with significant goals. We will find significant goals more worthy of chasing. We should know what is the standard of outcomes we will never accept. We should be aware of the level of outcomes we want out of our change. All the people who could bring a big change in the world were the people who had high standard goals. But, big changes require to first bring changes in ourselves. Our beliefs determine what is possible and what is impossible for us. If within our subconscious, we believe that what we are doing is doable, only then we will put an honest effort to do it. If subconsciously we will believe that what we are pursuing is impossible, then our belief will resonate in our efforts. So for our effort to be successful, we need to believe that we can get success in what we are doing. To make sure we achieve what we are looking for, we need the best strategy to reach our goals. But if we get our standards and beliefs in place, getting the correct strategy will not be a difficulty. The author suggests learning from the people who have already achieved what we are pursuing. By observing successful people, we can easily know our best course of action. But the knowledge alone won’t bring success to us, action on our strategy will bring success. Therefore you need to act once you know how to act. Our consistent actions shape our lives. Our consistent actions are derived from the decisions we have made in our life. In other words, the decisions we make today will decide how our life is going to be in future. The power of decisions can be seen in the fact that many rich kids, born with all the advantages in life, end up in rehabs due to the poor decisions they made in their lives. Many people born in sheer poverty end up being millionaires with the help of their sound decisions in their lives. Therefore if we carefully decide about what to focus on, what things mean to us, and what we are going to do about them, then we can achieve whatever we want. All the people who are living better lives than us have made these decisions better than us. People who do not make these decisions at all are the people who are directed by their environment instead of their own values. We avoid our pains and we are driven towards our pleasures. So if we want to control our behavior to make progress we should associate all our undesirable actions to pain and desirable actions to pleasures. Mother Teresa felt pain in the people’s suffering and pleasure in their well being. So with the decision of ending the world’s suffering, she started her action of social welfare. This made her the greatest nun the world has ever seen. Tony Robbins gives an example of how his mother used the pain and pleasure principle to keep him away from drinking. As a child, Tony thought it would be great fun to drink beer as his father used to become more playful after gulping some of it. So when he asked her mother to give him some beer to drink, so that he also can be like his father, she made him drink so much that he started feeling diseased and started to vomit. This incident associated the thought of drinking to a great pain of feeling diseased and hence since then, Tony stayed away from it. Our belief system has the power to create and destroy us. If we believe that we can do something then nothing can stop us. If we believe that we are incompetent, then we may not even try doing something to bring change in our lives. The author Tony Robbins gives the example of the famous Grandma Whitney who successfully scaled Mount Whitney 23 times between the age of 65 and 91. She has the record of climbing numerous other mountains as well. She was able to do this because she knew that the capabilities of a person are directly linked to his or beliefs. She believed she could do it, so she did it. Other women of her age group generally start preparing for winding up their lives. It is our will to believe what is pleasurable and what is painful to us. Therefore we should always consciously control our belief system. How to get what we really want? First, we should know what we exactly want in our lives. We may want expensive cars, jewels or gadgets, but why exactly do we want them? Having expensive possessions may give us a sense of pride or the feeling of fulfillment. So with a deep analysis can tell us that we are actually pursuing some feelings and all these material possessions are just the means to get those feelings. This is the state of awareness. When our mind is in the state of awareness then it knows what it wants. We are constantly pursuing pleasures and avoiding pain. But we can instantly change our beliefs about what is pain and what is pleasure by redirecting our focus and changing our mental or emotional or physiological state. How badly or brilliantly we are going to behave in a given situation is depended upon the state of mind/body we are in. We commit silly mistakes if we are less energetic or bored. We do complex tasks easily when we are having a fresh mind. So if we know how to control our states we can get exactly what we want in an effective and efficient manner. Keep having a fake smile on your face for few minutes, after some time, you will start feeling a little happy. Whichever emotion you fake to yourself, you will start feeling it genuinely. Practicing power postures will make you feel powerful and more energized. See Amy Cuddy’s Ted Talk for more on power poses. Try to feel good by laughing more often. Focus on good and happy memories. Avoid thinking about bad memories. Avoidance- Avoiding any situations which can lead to emotions which are fearful to us. Denial- Feeling bad from inside and pretending like we are not feeling that bad. Denying the presence of bad feelings. Competition- When someone tells us about his problems, we tell him how our problems are bigger than his problems. Competing to have bigger problems. But these ways of dealing with our emotions make us feel even worse. The best way to deal with emotions is to consider them as Action Signals. These emotions are suggesting us that our current approach towards our problems is not working and therefore we need to change our actions. We should consider our emotions as our guidance system. Emotions are not external influences, emotions originate within ourselves. We can feel good whenever we want. Just being grateful for the things we have can make us happy. This is why writing gratitude journal to stay happy is suggested by psychology experts. Every great man in the history had clearly defined values. What made any person great is the fact that he stuck to his values in every favorable and unfavorable condition. Non-violence was the highest value for Gandhi and he followed it throughout his life. Every decision he made for fighting was based on non-violence. In other words, values help us in making clear decisions. And abiding by our values make us great. Following our values brings the greatest feeling of fulfillment and violation of our values brings unrest to our souls. But the problem with most of us is that we are unaware of our values. We simply do not know what is most important to us. We are directionless. In such a situation, how can we expect to reach a destination? So what exactly values are? It is quite simple. Any belief that is dear to us is our value. We can have many different values. One value can be more precious to us than any other value. Every person prioritizes his value different than others. A clear hierarchy of value is a must. If you value family more than success, then living with the family should be your first priority and taking a higher position in your job should be the second priority. In this case, if you take that promotion and eventually sacrifice the quality time with your family, you will find that you are no more happy with your job. Therefore prioritization of values is important. We already know that we run towards pleasures and away from pain. Value conflict is a result of the fight between pleasure and pain. When we are pursuing what we value, we are pursuing pleasure. But sometimes our actions also have the risk of resulting in painful situations. When the result of our actions has an equal possibility of resulting in pain as well as in pleasure then value conflict occurs. Pleasure attracts us whereas pain repels us. We fail to decide the direction in which we should go. In such cases, we may stop ourselves from doing what we value. Value conflict stops us from doing what is right and sabotages us from achieving success. The ‘scarcity principle’ given in the world’s most famous book on influence psychology works in the above scenario. People react more when there is something to lose, and less when there is something to gain. We chose to avoid pain instead of gaining pleasure. Because of the fear of rejection, we do not ask. Due to the fear of failure, we do not try. We feel happy when we accomplish or achieve something. We feel good when we get what we were thriving for. When we fail to attain what we wanted, we feel upset, unhappy. If we closely observe what we are doing, we will find that we are making rules. These rules made by us dictate when we will feel happy and when we will feel sad. And sadly, according to our rules, there are just a handful of occasions when we can feel happy, but for being sad, there are plenty of occasions. How can we live a happy life when we do not allow ourselves to be happy. Do not let your emotions to be dependent upon a rule which is impossible to meet. Do not let your emotions to be dependent upon something which is not under your control. Do not have a few ways to feel good and lots of ways to feel bad. Your emotions can be controlled whenever you want to control them, do not be in control of your emotions. We behave in accordance with our identity. Our beliefs about ourselves form our identity. Whatever makes us unique from others is our identity. When we identify ourselves as an honest person, we behave honestly. When we think we are a crooked person, we behave in that way. If we think we are capable of doing something, we approach the task with confidence. When we believe we are incapable, we don’t even try. But as we develop new beliefs about who we are, our behavior will change to support our newly formed identity. Therefore we should form our identity in such a way that it supports us, not as the one which opposes us. So this was the summary of Awaken the Giant Within. I suggest you read the complete book for your real growth. Here I am sharing the related free download links from the author himself. Add the book to your Amazon cart by clicking the image below. Thanks a lot for your appreciation Avinash. Thanx a lot Sanjay! I am myself planning to convert all my blogs into an E-book so that people my readers can have them all the time. Please share the summaries with your friends too.